Need more information about booking Home 7266084 ? 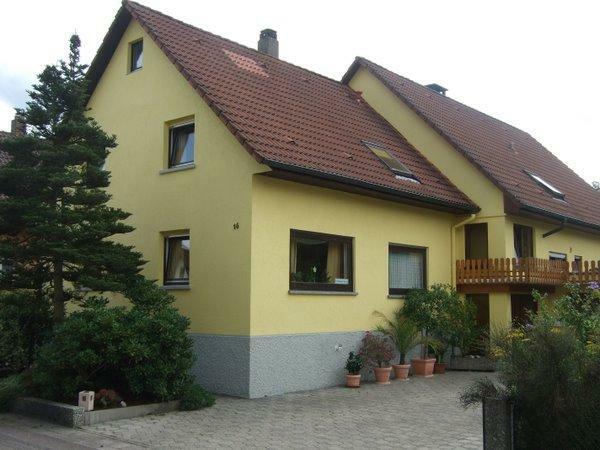 Comfortable, fully furnished 4-star holiday home / Holiday in Oberkirch in the sunny Ortenau. The house can accommodate 2 - 5 people. Near Strasbourg, Baden-Baden, Europa Park and Freiburg. The apartment can accommodate the whole family. The living space of 105 square meters is divided on two floors. The living and dining area, kitchen and a bathroom with shower and toilet on the ground floor. In 1st floor is the sleeping area, bathroom with shower and toilet. The large living room is divided into a dining area and a cozy area. Comfortable elements invite you to relax. An electric fireplace offers relaxing atmosphere. A children's corner and a lot of games provide variety. Internet connection, satellite TV, DVD, stereo radio with CD player are available. The fully equipped kitchen with fridge-freezer, dishwasher, microwave, ceramic hob, oven, coffee maker, toaster, egg cooker, kettle, etc. We also offer a dining table for 6 people. A high chair for children is available. The sleeping area is located on the 1st floor. Two double rooms and one single room (interconnecting room, ideal as a nursery) with an additional cot, a bathroom with shower and toilet. Close to the center and not located in a quiet residential area, the heated outdoor pool of Oberkirch in the immediate vicinity, hiking and biking trails, the beautiful landscape at the Rench, bus and train terminal far, so they live in the most beautiful time of the year: in their holiday or her holiday. We make sure they like with us and they feel comfortable. For the summer months we have prepared a nice patio with garden furniture. We have a private car park. Pets on request. During their stay, they receive a ticket from Oberkirch. This entitles you to free travel by bus and train in the defined KONUS zone - includes almost all the Black Forest and the Rhine valley from Karlsruhe to Basel. They can explore our beautiful surroundings free. Just a few kilometers away lies the pilgrimage church of Lautenbach. By Allerheiligen waterfalls to get to the monastery Allerheiligen. Through awards in the press of the trail Renchtal riser is known geworden.Weitere known trails: Kandelhöhenweg, Ortenauer Weinpfad. In half an hour you can reach the Europa Park in Rust. A day trip is worthwhile in any case. Strasbourg with the European Parliament is about 20 km away. You can get in touch with Gebhard (the owner) through the contact form on this page. Send Gebhard (the owner) an email through the contact form on this page. Alternatively, if there’s a phone number on this page, you can call them. How do I contact Gebhard (the owner)? If you’ve already booked, go to Manage your holiday booking to view Gebhard the owner's contact details or send them a message. Or send Gebhard (the owner) an enquiry through the Contact the owner/manager form if you’d like a quote or more info first. When you pay online through the Book your stay form, a booking request is sent to Gebhard (the owner). You’ll find out within 24 hours whether they’ve accepted - no money will leave your account before then. You can also request a quote from Gebhard (the owner) through the contact form. The owner will email you the total cost for your dates and a link to book and pay online. Use the Book your stay form to pay provisionally online. You can pay by credit/debit card or PayPal. Gebhard (the owner) will have 24 hours to accept the booking and no money will leave your account before then. Why can't I call Gebhard (the owner) before booking? You’ll need to contact Gebhard (the owner) to do this. Send them a message in Manage your holiday booking or through the contact form on this page. You can request to change the dates or number of people on your booking via the Manage your holiday booking page. To change your holiday dates use the Edit booking button. If you need to change the number of guests staying then send Gebhard (the owner) a message. If Gebhard (the owner) agrees, they’ll send you a revised quote outlining the changes. You can review and accept/decline this from the Manage your holiday booking page. You’ll have 48 hours to take action before the revised quote expires.